1. Corey Kluber CLE - Top pitcher on the best team in baseball. Kluber has posted a dominant 17-4 season with a 2.27 ERA. In the month of September, has a 0.87 ERA and a 0.65 WHIP. Should be top overall pick for post-season long fantasy leagues. 2. Clayton Kershaw LAD - 17-4 overall but has been human in September with a 3.74 ERA. Dodgers favored to win NL - so this puts him ahead of other elite AL pitchers on teams not named Cleveland. 3. Justin Verlander HOU - 4-0 since traded to Houston and has been impressive and nearly unhittable with a 0.64 ERA in September. 4. Chris Sale BOS - Strikeout artist with 300 K's on the year. Excellent pitcher but how far will BOS be able to go in the postseason? We've opened up fantasy league registration for the MLB playoffs! Use early bird offer code EB_MLB_2017 by 9/28 for a 15% discount off your league costs. Changed ‘Saved’ players to a Queue (live drafts). Added support for Silent Auction drafts. Please see https://www.fantasypostseason.com/help/auction_drafts for more info. Changed our system to limit the number of QB/DEF/Goalies that can be auto-drafted (due to the limited number of starters available). Please see the Drafts section of the NFL/NHL Rules for more information. Added Round and Pick support for offline drafts. Consolidated waiver emails to one per league (now shows all Acquired/Failed to Acquire in one email, with a reason the acquisition failed). Granted the commissioner the ability to apply retro scores (if the league is activated after the playoffs start). Added support for Free Agent Acquisition Budget (FAAB). Managers have a budget of 100 pts to blind bid on free agents. Each league manager is allowed to start only one player each day, and can only start that player once during the entire postseason. The winner will receive a $2,500 donation from Fantasy Postseason to their charity of choice in their name. Good luck! Join our free contest for the NBA playoffs and win prizes. Simply pick a new player to start for each game day of the NBA playoffs. Standard Fantasy Postseason scoring applies. The entry with the highest cumulative total wins. First place wins a new Amazon Echo and a custom trophy from Affordable Trophies. Prizes also will be awarded to 2nd and 3rd place finishers. The 2015-2016 Stanley Cup Finals featured the San Jose Sharks v. the Pittsburgh Penguins. These teams are well represented in the Top 15 scorers from last year's NHL fantasy postseason (using default scoring at FantasyPostseason.com). This should serve as a reminder in elimination player pool formats to choose players from teams that are poised to make a deep run in the playoffs. There's one huge difference between regular season and playoff basketball, and that is how defense is played. Players hustle, defend the paint, and get back during transition play. The game tends to be played in the half-court. This translates to fewer fast breaks and easy baskets. So what impact does this change in play have on actual scoring statistics in the NBA postseason? See below for how some top NBA players performed in the 2015-16 postseason compared to their 2015-16 regular season averages. 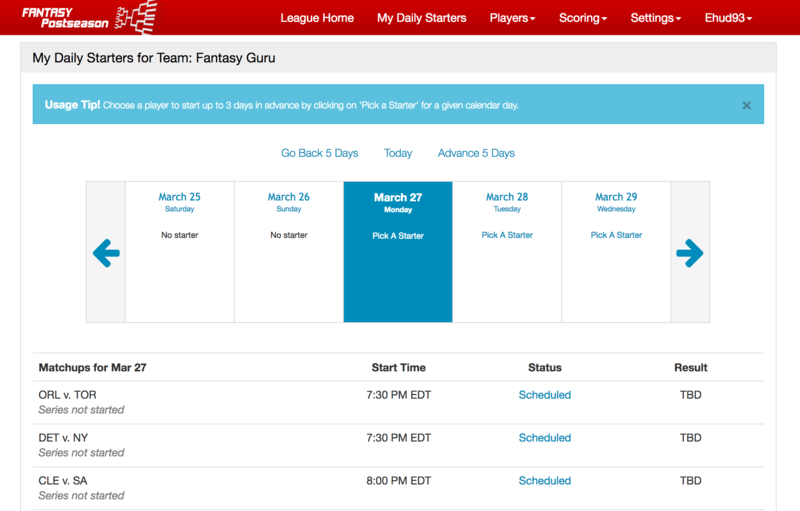 Last year we introduced the Pick One Daily fantasy gaming format for the NBA, NHL, and MLB playoffs. In this model, Managers choose a new player to start each day, but can only use that player once during the entire playoff period. It's a lot of fun, requires strategy, and keeps managers engaged throughout the postseason. Managers access the 'My Daily Starters' page, click on 'Pick A Starter', and can then select a player for that given day. Further, no bench management is required. Last year, managers would need to manually drop players that have started to make room for new players; this process has been simplified considerably. If you have any questions or suggestions for improvement, please contact us at admin@fantasypostseason.com. We've opened up registration for NBA & NHL Playoff Fantasy leagues. Use early bird offer codes EB_NBA_2017 & EB_NHL_2017 for a 15% discount off your league costs. The 2017 NFL offseason has been quite the roller coaster ride. From teams losing their top talents to free agency to the anticipation of the 2017 NFL Draft, this offseason has been one for the ages. The veteran player has found that locating staying power is something that is difficult to find. Adrian Peterson, Jamaal Charles, Danny Woodhead, and Eddie Lacy will all have new homes come the 2017-18 season, a large shake up at the running back position we haven't seen before. We're running a free contest for the NCAA Tournament. Win Prizes! Registration for NCAA tournament fantasy leagues is now open. Create your league now and enjoy the madness! We've added Return TDs as a new scoring setting for fantasy football. This value defaults to zero. If your league expects to reward individual players for punt return and kick return TDs, please modify this setting accordingly. Note that DEF/ST will still earn points as special team TDs for those plays. Join the Fantasy Alarm Challenge for the NFL Fantasy Football Playoffs. Win prizes. Free to join! The first round games are set..
Week 17 is here and by the night's end the NFL playoff seedings will be set. Our player pool will be updated shortly thereafter. Courtesy of NFL communications, here are the various playoff scenarios. At present, we have no plans to further support any platform specific (e.g. iOS or Android) apps. Our first set of projections have now been computed. Here are the top 10 ranked players for this upcoming NFL postseason using standard scoring. No surprise that Brady leads the pack. At Fantasy Postseason, we offer a number of different options for those who want to keep playing fantasy football during the NFL playoffs. There are three basic configurations that most commissioners use. The most common and also most basic is the Player Pool - the further your players advance, the more points your fantasy playoff team scores. This is a simple game format and is especially good for a large number of participants. The second format that is growing in popularity is the Start Once format. Managers can start anyone they want each weekend of the playoffs, however they can only start that given player once throughout the postseason. There's a lot of strategy with this approach and usually keeps managers highly engaged throughout the entire postseason. Entering Week 14 of the NFL season, nearly every fantasy league, regardless of how screwy its settings are, is either in the playoffs already or getting there next week. Not all owners will make it to hallowed postseason play. Those in contention will have some big decisions to make this weekend...not the least of which resides in New England. Owners of Rob Gronkowski may not have made the fantasy playoffs. It would be understandable if they came up short. Gronkowski, the clear-cut top TE preseason, ranks just 10th at the position through 13 weeks. Using a first-round pick on a tight end that misses half the year and then gets put on injured reserve is a hard obstacle to overcome. If someone did make it through the regular season, though, they will need a starting tight end for Week 14. We've opened up registration for our 2016-2017 playoff fantasy football leagues. New Responsive User Interface Design - Our new UI is cleaner, more usable, and device independent. Limiting the # of Players from Each Team - Commissioners can now limit the number of players from each playoff team. This prevents managers from "loading up" or going all in on one or two particular teams. Requiring 1 for 1 Free Agency Transactions - This configuration option requires that free agent player swaps are one for one. This is particularly useful if you are in a Salary Cap league and you want to prevent players from dropping 2 less expensive players to pick up 1 more expensive player. Allowance for Late Joins - Commissioners can now allow managers to join after a league has been activated. The regular season fantasy football playoffs are right around the corner. Thanksgiving week is always a turning point in the NFL as well as fantasy. It's a time where owners comfortable with their place in the standings can begin to make moves looking ahead. It is a time where those on the bubble break out all the stops to just get into the playoffs. Just like real life football, all it takes to win a title is getting in and getting hot. Every year, there are random dudes who swing fantasy postseasons. Often, these are guys no one had ever heard of weeks before who suddenly fell into playing time through injury or what have you. In 2016, the story is vastly different. Instead of no-names getting huge opportunities, we will have the biggest of big-name stars returning right before or during the fantasy playoffs. Relievers are often the Rodney Dangerfields of fantasy baseball, they get no respect. However if you look at the top scorers in last year's MLB fantasy postseason, you'll find a number of relievers in the top 25 overall scorers. Wade Davis (KC) was the leading reliever, checking in at #12 overall with 59.27 pts. Notably, he outscored the likes of Josh Donaldson (#13), Jake Arrieta (#14), Alex Gordon (#15), and Kendrys Morales (#16). Further down the list you'll find the Royals setup man Kelvin Herrera at #19 with 51.12 pts. Jeurys Familia, the Mets closer, ended up at #22 with 46.22 pts. So as we turn our attention the the 2016 MLB postseason, we should take a look at which postseason bound closers and setup men are finishing the regular season on a high note. Yesterday we took a look at hitters who have had hot bats in the month of September. Let's now turn our attention to starting pitchers to focus on for your upcoming posteason fantasy baseball drafts. A key step in preparing for your fantasy baseball playoff draft is reviewing the list of players on playoff contenders that are entering the postseason with a hot bat. These are the players that you need to keep an eye on..
A Cubs vs Indians World Series: Can this be the year? The first major league baseball team to win back-to-back World Series was the Chicago Cubs (1907-08). But then the droughts came and they haven't won since. On the other side of the playoff bracket, you'll find the Cleveland Indians. The Indians last won a championship in 1948, though, they have knocked on the door several times since then. They represented the American league in the World Series in 1997, 1995, and further back in 1954, losing each time. So what are the chances that these two longsuffering teams could end up facing each other in this year's MLB postseason? The Cubs have clearly been the strongest team in baseball during the regular season and are odds on favorites (21/10, +240) to win a World Series ring in October. Cleveland is a solid team, but they have more modest odds (9/1, +950). The MLB playoffs are a few weeks away and soon you'll be planning for your postseason baseball draft. Let's review the results from last year's fantasy postseason (using standard Fantasy Postseason scoring) to see what lessons we can learn. Daniel Murphy was the top scorer, and this is no surprise given his incredible performance. He's a prime time performer and someone who can be expected to do well when the lights are the brightest. The rest of the top ten is mostly composed of players on teams that made the World Series, with the lone exception being Jose Bautista whose Jays lost in the ALCS. No doubt, the key to doing well in a player pool is picking players that are going to both do well and also advance to the World Series round. One other thing to note is that 8 out of the 10 players are position players, not pitchers. Pitchers can be risky, since their scoring is heavily dependent on them getting credited for wins and/or saves. We have opened fantasy league registration for the MLB playoffs! Get your postseason leagues started today and invite your friends to join. Drafts will begin on September 30th. In addition to updating our user interface to be compatible with all devices, we have added a number of new features this summer. Here's the run down. Longer Preservation of Previous Year's Leagues - We will now keep league history around for 2 years. You can study the prior year's rosters and player performance to gain a leg up on your competition.